While I was in AZ on my vacation, I picked up a few Valentine’s Day fabrics from Joann to add to my stash. I find Joann fabrics are not the same quality as the quilt shop fabric, but for a seasonal project that won’t get much wear they are perfect. When you go into the stores now all you see are Valentine-themed chocolates and decorations so I decided to dig out the Valentine fabric and work on some projects. 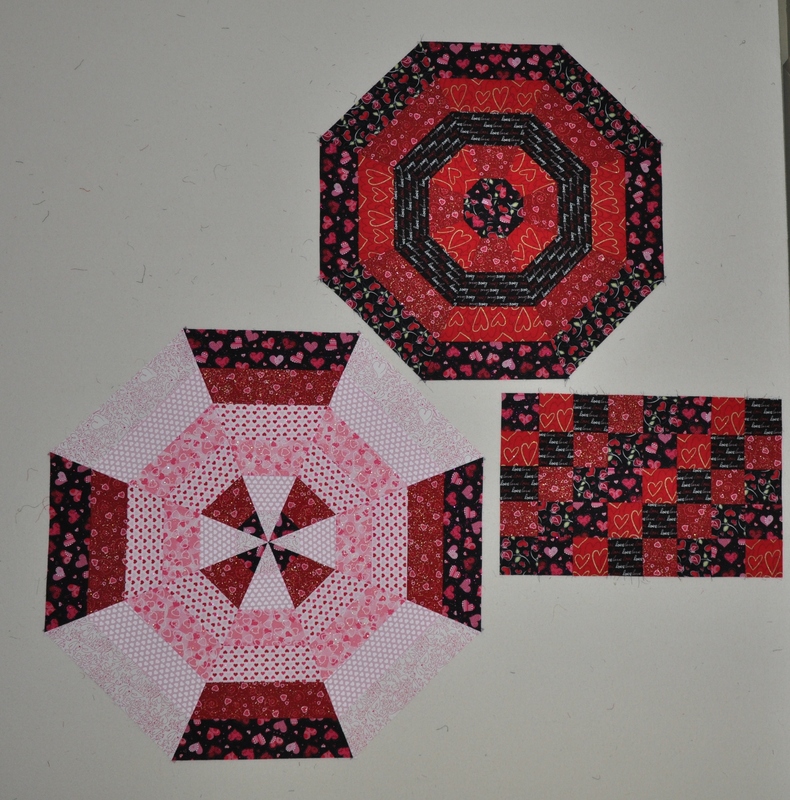 These projects are still flimsies and they are remaining on my design wall until I get them quilted. The smaller octagon is made from 5 x 3″ strips of fabric (finished topper: 25″ across) and the larger octagon is made from 6 x 3″ strips of fabric(finished topper: 30″ across). Because the smaller table topper took less fabric, I had quite a bit of the leftover strata. I decided to piece the leftovers together into the rectangle you see in the picture. I am not sure if I will just quilt this the way it is or if I will add something more to it. Tonight I finished another flimsy. Three finishes in one weekend is a record for me. After finishing Popsicle Sticks on Friday night and Got Stripes? on Saturday night, I was ready for a reward project today. It is nice to be able to decide on a project and make it entirely from your stash. This top was made from a panel that I had in my stash for quite some time. I used Kari Nichols’ pattern Sidelights. Because my panel was not the size that Kari had in her pattern, I had to make some adjustments to the pattern. This panel was not perfectly square which added to the challenges of putting together this quilt top. This quilt top finishes at 47″ x 54″.